Fun Fact: In addition to selling custard, the stands also sell Christmas trees. Ted Jr. travels to Nova Scotia each year to bring back the best Canadian balsam fir trees. Menu Highlight: The custard itself is world-famous. It comes in several flavors and can be combined with lots of different toppings. The shop’s specialty, “Concrete,” is popular; Adam Richman created his own when he visited. 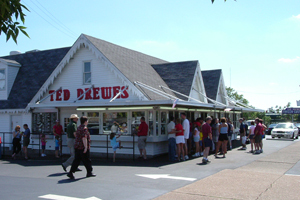 It all started when Ted Sr. opened his first ice cream store in Florida in 1929, followed the next year by an other store on Natural Bridge in St. Louis and the South Grand store in 1931. In 1941 the family opened a second south side stand which is the current Chippewa location, old route 66. By 1958, the south side stands were all that remained. 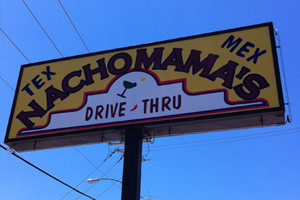 Fun Fact: There are at least 3 other Mexican restaurants called Nacho Mama’s in the US (Los Angeles, Baltimore and Richmond). Menu Highlight: The Super Tex or Mex gives you a variety of food, including tacos, enchiladas, chalupas and fajitas. Founded by John & Nancy St. Eve in 1994. Located on Gravois and McNair, Hodak’s has been St. Louis’ premiere stop for chicken lovers since 1962! In an ongoing effort to serve our customers, our menu, specials, and more are now available at your fingertips! 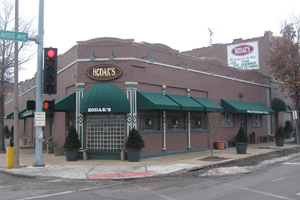 Founded in 1962, Hodak’s Restaurant & Bar began as a tavern nestled on the corner of 14th and Emmett. There, owners Tony and Helen would sporadically bring in the misses’ chicken to serve the customers. As fate would have it, the recipe won over the crowd, and a fine tradition was set in motion. 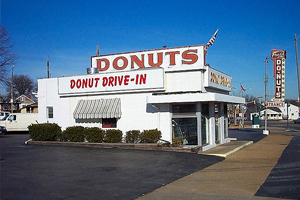 St. Louis locals love the Donut Drive-In, which won the vote for best donuts on Route 66. Alton discovered that the same family recipes from the early 1950s are still being used for the popular chocolate Long John and cinnamon rolls. Fun Fact: Put your credit card away because this place is cash-only. Menu Highlight: Dessert is what draws people to this overlooked restaurant. Locals and visitors say it is the best pie, period. 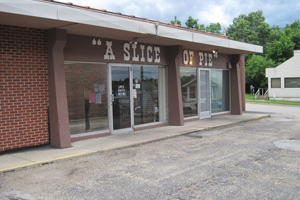 They offer more than 25 types of pies. A Slice of Pie tends to get overlooked by roadies because it’s on a more obscure alignment of Route 66. It’s tucked away in an old strip mall at 601 Kingshighway. But even with the traditional U.S. 63 alignment of 66, it’s just a stone’s throw away. For lunch or dinner, A Slice of Pie usually has quiches (such as bacon and spinach), salads, pot pies and soups, along with a warm, soft dinner roll as big as your fist.